EZVIZ has produced its fair share of indoor and outdoor home security cameras. Now it has set it sights on your front door—literally—with the EZVIZ DP1 Smart Video Door Viewer. It replaces your door’s peephole with a camera that lets you see real-time video of visitors, deliveries, and potential intruders. To date, our favorite peephole camera has been the Brinno Duo, so it’s hard not to judge the EZVIZ DP1 against it. There are some clear differences right out of the box though. Both the DP1 peephole camera and display are constructed of zinc alloy, which makes them feel much more substantial and durable than the plastic Duo. The DP1 is also less discreet than the Duo. 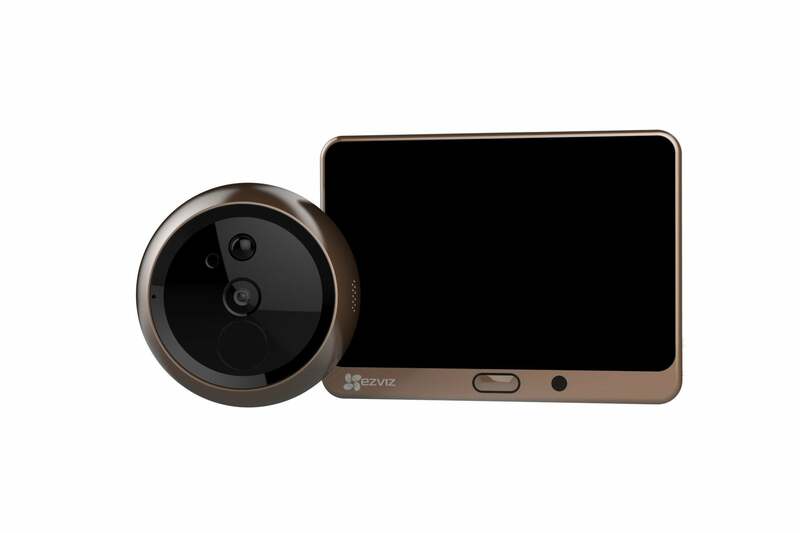 Where Brinno’s camera looks pretty much like any other peephole you’d pick up at a hardware store, EZVIZ’s is clearly a camera, with a visible lens, sensor, and doorbell. It’s even branded with the company logo. The EZVIZ DP1 includes a 720p wide-angle lens and a 4.3-inch color touch-screen display. Also unlike the Duo, the DP1 records video locally to microSD as well as the cloud. A free 30-day CloudPlay subscription comes with purchase of the camera. After that, a 7-day playback plan costs $6 per month or $60 per year, and a 30-day plan costs $11 per month and $110 per year. Before you can install the DP1, you first have to charge the display panel. A USB cable and AC plug adapter are supplied for this, and it’s recommended you charge the 4600mAh lithium battery for 5 to 6 hours. While the display is charging, you can prepare the camera for installation. That involves choosing one of three supplied screws that corresponds to your front door’s thickness and screwing it into the stem on the back of the camera. Next, you have to remove the door’s peephole, then thread the camera’s stem, plus its wire—which is really a flat ribbon—through the peephole bore. If you find the camera stem can’t fit through the hole—which is quite possible as it’s fairly thick—the user manual advices you to drill a separate hole of “about 16.5mm to 30mm” (or approx 1/2-inch to an inch) in your door about 5 feet up from the ground. You can “answer” your door when you’re away by using your smartphone. Once the camera is in place, you plug its wire into the bottom of the display’s plastic mounting base, then secure the base to the inside of the door with it’s set screw. Finally, you slot the display into the mounting base and turn it on. 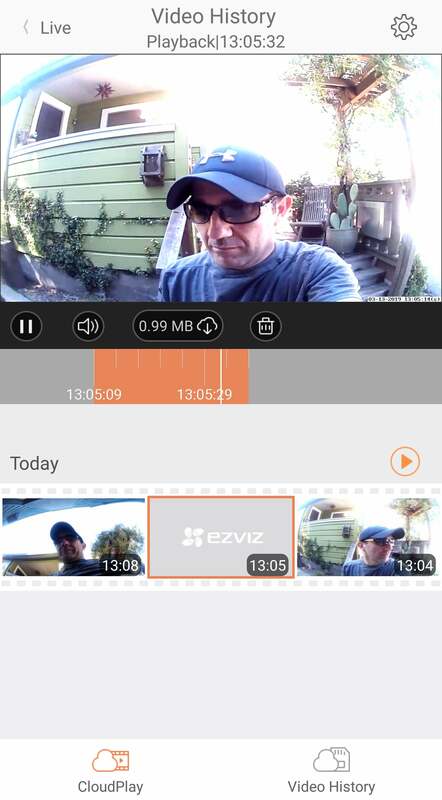 The final steps are connecting the camera to your Wi-Fi network and adding it to the EZVIZ companion app. The first is easily done by going to the Wi-Fi settings through the display’s menu, selecting your network from a list and entering your password. The second is just like setting up any other smart device: create an account, add the DP1, then follow the prompts to link it to the app. The only hiccup here was when the app asked me to enter the “device password,” something not mentioned in any of the product documentation. After some sleuthing, I found a “verification code” on the back of the display, which turned out to be what the app was asking for. 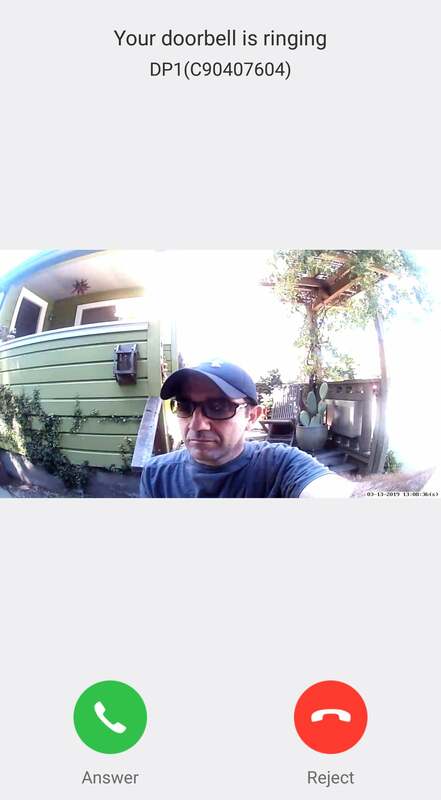 Really, the DP1 functions like a peephole camera and a video doorbell. Someone rings the device’s doorbell and the signal travels to both the display and your smartphone, and you can view who it is on either device. In either case, you’ll get a clearer image than squinting through a peephole thanks to the DP1’s 720p wide-angle lens and 4.3-inch color touchscreen. In HD mode, the image is tack sharp with balanced colors, and the field-of-view captures a clear head-and-shoulders view of anyone standing directly in front to the lens. The camera uses passive infrared (PIR) technology to detect body heat, so motion detection isn’t likely to get tripped by swaying tree branches or passing cars. When human motion is detected, the DP1 emits an alarm and pushes a notification with a snapshot of person to your phone. These alerts were timely and accurate throughout my testing. Video clips are captured of all visitors. You can turn motion detection on and off in the settings in the app or on the display, but you can only customize it on the latter. Here you can adjust the sensitivity level, change the alarm sound and volume, and tweak recording settings like clip length. The DP1 pairs with the same companion app as EZVIZ’s line of home security cameras, so you can view its feed as part of a multi-view layout with any of the company’s other cams. Camera controls for the DP1 are straightforward, with push-to-talk, snapshot, and record buttons laid out under the live-stream pane. The primary use of the app, though, is to remotely “answer” your door. When someone rings, you’re presented with the option to answer or decline much like when you get a phone call. You’re also served a snapshot of the person to help you decide which you want to do. Every person who rings your doorbell is added to a call log. Entries are date and time stamped, labeled Missed or Received, and include a snapshot. A separate video history logs all your locally- and cloud-recorded clips. You can download any clip to your phone, and it’s saved in a special album accessible through the app’s menu options. If you’re looking for something more discreet and less vulnerable to vandals than a video doorbell, the DP1 is a good option. However, the likelihood that it means drilling a new or bigger hole in your front door makes it a non-starter for most renters. If you’re in that camp, the Brinno Duo is your best bet. It’s a more straightforward (and less obvious) peephole replacement and still lets you see who’s at the door when you’re not at home, though not interact with them. Still, that gives you a viable excuse when your neighbor comes to borrow your weed whacker again.